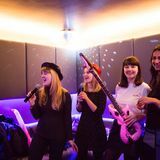 "The best karaoke bar in London town - Lucky Voice, Islington offers seven private karaoke rooms for up to 15 people. 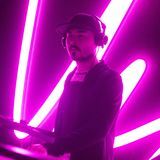 With over 8,000 songs to choose from, including all the latest chart toppers and golden oldies, room service and an impressive cocktail menu, you're guaranteed a great night out. You can book months in advance for planned parties, or walk in on the night if you fancy a spontaneous sing (depending on availability). Book online or phone the venue and start lining up your playlist before your visit with Lucky Voice Online Karaoke." By sending this booking your details will only be sent to Lucky Voice Islington and will never be shared with other third parties. By clicking this box you agree to the Terms and Conditions set out above. You can book to reserve an area of Lucky Voice Islington for you and your friends. Just enter your requirements below to see what they have to offer. Minimum booking of 4, maximum booking of 15, 1 adult required for every four children. Visit the Lucky Voice website or call us for more information on pricing and availability! What did you think of Lucky Voice Islington? I Just love it here! Went and had a look around the newly refurbed venue the other weekend and it looks absolutely amazing! Karaoke and cocktails, not really sure what more you could want! Absolutely love the new refurb! The bar area is a lot bigger than before so there's a lot more room to dance and they've now got a photobooth which is perfect after a few drinks! Really like the bar, feels very cool in here! Then once you've had a few cocktails and feel like going for a sing they've got private karaoke rooms in the back - awesome!! Already planning my next visit!! Had been to Lucky Voice Islington about a year ago and went last weekend for a friend's birthday it looked amazing! Loved the fancy dress outfits and photobooth and bar area was nice to drink in before. If you are looking for a venue with professional staff who will attend to you and your guests then this is not the place for you. The staff are very unfriendly, unhelpful and make you feel like an inconvenience. Put plainly they are a miserable bunch who could benefit from a few lessons in hospitality. I certainly won't be going back! Think karaoke, think Lucky Voice. Islington’s bar lives up to the chain’s reputation with its set-up finely tuned for a fun night out. Based on Upper Street and less than ten minutes’ walk from Highbury & Islington tube, Lucky Voice Islington is as popular as its Soho sister. The window-fronted bar opens out into a colourful space of oranges, pinks and black, with plenty of sofas and seating to allow you to settle in for the night before or after your sing-off. 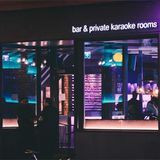 Even with seven private karaoke rooms, this place can get booked up throughout the week, so be sure to plan ahead if you want to try it out; the rooms can be reserved for a minimum of two hours at a time and are well worth the cost if you can split the hourly rates between a big group of you. Each room is as colourful as the bar and contains fancy dress gear, low lighting and a mirror ball to get you in the mood – and it works a treat. Rooms are also circled with seating so you can sit back and watch as your friends belt out a ballad or banish nerves with a drink from the sidelines. 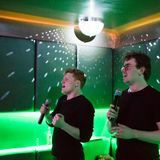 Given the nature of karaoke, it’s fair to say everyone is on a high at Lucky Voice – you won’t see any sad faces or pretentious groups here because everyone is out to have a good time. Even those who prefer to keep their non-pitch-perfect voice to themselves won’t be able to stay quiet for long, as the private rooms generally turn to mayhem with everyone joining in. It may not be the focus of your night, but you’re bound to want to stick around in the bar for a debrief of your night over a few more cocktails too, thanks to its inviting vibe and cosy seating – plus on Friday and Saturday nights the later opening hours can create quite the party atmosphere. The karaoke machine in each room is impressive - a huge catalogue of tunes is held in the touch screen computer, making it a crowd-pleaser that’s foolproof to use. There’s little you won’t find on there that keeps everyone’s vocal chords happy. You can pick as you go, or for a more efficient use of the time, queue up a playlist of songs to make sure everyone’s got something to sing. Meanwhile, in the bar, the soundtrack is a mix of classics and chart tracks so you can continue to sing along to those well known words, should you wish. Lucky Voice Islington knows its audience and provides perfect sharer food for its groups of happy punters. Pizza always goes down well and there are four delicious ones on offer at just £7.50 each, complete with dipping sauces. However, if you just want a little something to go with your drink there are nibbles for just £2.50, such as mixed nuts, jumbo pretzels and various hand cooked crisps. A clever ‘Thirsty’ button sits in each karaoke room and whenever you press it a member of bar staff will arrive to your room to collect your drinks order – you may have to wait a little while, but it’s worth it if you don’t want to miss out on any fun during your booked sing session. Service does come at a price, however, so if you can nip out to the bar, you’ll avoid the service charge at the end of the night. The drinks themselves are worth every penny, however; a humorously written and extensive menu offers ten quirky cocktails, a few signatures and of course the well-loved classics. There’s surprisingly plenty of choice when it comes to wine, too, which starts at just £3.50 a glass, while beers and cider are available including Asahi, Tiger, Heineken and Asahi Draught starting from £2. If there are enough of you in your singing group, spirits by the bottle might be a good way to stay on a budget, with prices starting at £100 for a bottle of Bacardi. Perfectly in tune with its clientele and with friendly service to boot, you’d be hard pressed not to have a great night out at this bar, which is becoming a karaoke classic of its own. Disappointing evening at Lucky Voice Islington. We went to celebrate two birthdays and arrived looking forward to singing together. Our room was ready 10 minutes late but after 1 hour and a half in the room we were given a 10 minute warning. I had to argue with 3 members of staff to get our time and even then we were still cut short by 5 minutes. Not what I expect to have to do on my birthday and not for £80 an hour. Facilities were average. Not worth the money or aggravation. The karaoke setup is standard with everything you need.The customer service leaves a lot to be desired though. From not providing a tab separate to the karaoke booth's at the weekend bc it's "inconvenient" for them to the bored-seeming, schoolmaam-like booth operators. Not a venue I will be returning to.